Edwin Powell Hubble (November 20, 1889 – September 28, 1953) was an American astronomer. Hubble's findings changed the scientific view of the universe. In 1925 he showed that there are galaxies beyond our own, the Milky Way. Also, he developed a method for classifying galaxies. In 1929 Hubble formulated what is called Hubble's law. The law states that the greater the distance between any two galaxies, the greater their relative speed of separation. Georges Lemaître, a Belgian priest and astronomer, had published the idea two years before in an obscure journal. Nevertheless, the idea bears Hubble's name to this day. Today, the 'apparent velocities' of galaxies are understood as an increase in proper distance which occurs due to the expansion of space. Light traveling through stretching space experiences a Hubble-type redshift. This work helped to establish that the universe is expanding. 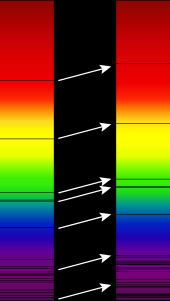 Some have incorrectly said that Hubble discovered the Doppler shift in the spectra of galaxies, but this had already been observed earlier by Vesto Slipher, whose data Hubble used. The Hubble Space Telescope was named for Hubble. A classification system for nebulae, both galactic (diffuse) and extragalactic (both nebulae inside our Milky Way galaxy, and other galaxies outside it). Hubble settled decisively the question of the nature of the galaxies (as being other things like the Milky Way). The distribution of galaxies was found to be homogeneous in distance (the galaxies were all over the universe, not in any particular location). The linear velocity-distance relation was established. This discovery lead to the notion of the expanding universe which is the centre-piece of the cosmology of the present day. "… if redshifts are velocity shifts which measure the rate of expansion, the expanding models are definitely inconsistent with the observations that have been made … expanding models are a forced interpretation of the observational results"
"[If the redshifts are a Doppler shift] … the observations as they stand lead to the anomaly of a closed universe, curiously small and dense, and, it may be added, suspiciously young. On the other hand, if redshifts are not Doppler effects, these anomalies disappear and the region observed appears as a small, homogeneous, but insignificant portion of a universe extended indefinitely both in space and time." Hubble's words were forgotten, and the notion of the expansion of the universe became the consensus. Until the theoretical developments in the 1980s no one had an explanation for why this seemed to be the case. The question "why is the universe expanding?" is now answered by understanding the details of what happened in the first inflationary epoch (10−32 seconds) of the existence of our universe. ↑ Marcia Bartusiak (2010). The day we found the Universe. Random House Digital, Inc. pp. x–xi. ↑ Hubble, Edwin (December 1926). "Extragalactic nebulae". Astrophysical Journal 64 (64): 321–369. doi:10.1086/143018. ↑ Livio, Mario (9 November 2011). "Lost in translation: Mystery of the missing text solved". Nature 479: 171–173. doi:10.1038/479171a. https://www.nature.com/articles/479171a. ↑ 6.0 6.1 Sandage, Allan 1989. Edwin Hubble 1889-1953, The Journal of the Royal Astronomical Society of Canada, Vol. 83, No.6. Retrieved 2010-03-26. ↑ Red-shifts and the distribution of nebulae, Hubble, Edwin 1937. Monthly Notices of the Royal Astronomical Society, 97, p513. The SAO/NASA Astrophysics Data System. This page was last changed on 18 April 2019, at 17:01.